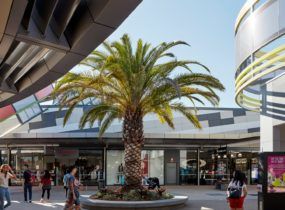 Designed to incorporate a retail, dining, entertainment, residential and commercial precinct Queen Street Southport is set to transform Gold Coast’s Southport. The $550 million village will be an integrated masterplanned community, featuring showrooms, food and retail tenacies, offices, childcare and medical centres, high-rise living and a cinema with at least seven mid-rise towers. 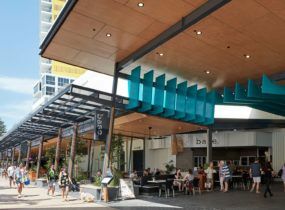 A key element of the design brief is to include a range of uses to keep the precinct active and vibrant, and built in stages to suit market demands. The overall design will complement the site’s physical characteristics and the wonderful Gold Coast climate. 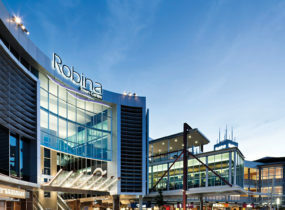 At the centre of the site is the central plaza – a large landscaped space that includes convenient parking and is surrounded by activated shopfronts and building entries. Buildings have been architecturally designed to maximise the views from every direction. The proposed material palettes for the buildings will imbue distinct character while promoting harmony across the breadth of the site. The materials on the towers are crisp and modern while the colour schemes maximise the impacts of light and shade on the external walls. The project will really bolster Southport as a place where people can work, live and play.